In these best Swiss Army knife reviews, we list 5 of the best multi-tools from Victorinox for under $100. In these reviews we place an emphasis on items that will please the average outdoorsman (or woman) while also being portable enough for everyday use. All of these products are manufactured to high standards with Victorinox quality which has seen the company grow from a mom and pop outfit started in 1884 to a global brand that it is today. All products carry the lifetime warranty and the companies unique sense of pride and manufacturing history. It’s worth pointing out that all of these knives, with the main blade being under 3″, fall into the Everyday Carry (EDC) classification. It’s worth checking though on the current law within your state if you plan to carry one of these Victorinox knives around everyday and furthermore if you plan to travel across states. View More Images Of The Victorinox Swiss Army Champion On Amazon There are 30 stainless steel tools in this 0.1lb knife. These include a main blade, a metal saw, scissors, a wood saw, a magnifier, 3 differently sized screwdrivers, a parcel hook and a corkscrew. It comes with a lifetime warranty, of course, and also has a ballpoint pen. This is one of the brand’s best products on a value-to-price basis. It has some of the most important tools possible on it, from Phillips and mini screwdrivers to wood saws and chisels. It doesn’t have pliers, of course—that’s the compromise when you’re getting something this light—but they’re not really necessary here, especially given how small they would be to have to fit into the Champion Plus’s length. On the whole, it’s an amazing value for about $75, especially given Victorinox’s usual lifetime warranty. The SwissChamp is a 3.5in multi-tool knife with a whopping 33 functions packed into its 6.56oz frame. Stowed away within the polished Cellidor handle is a medley of tools that include the following: a large blade, a small blade, a corkscrew, a can opener, a bottle opener, a wood saw, a reamer, a fish scaler, a hook disgorger, wire cutters, a wire crimper and a pressurized ballpoint pen. It also has a hooked 7cm ruler, a magnifier, a mini-screwdriver and pliers. 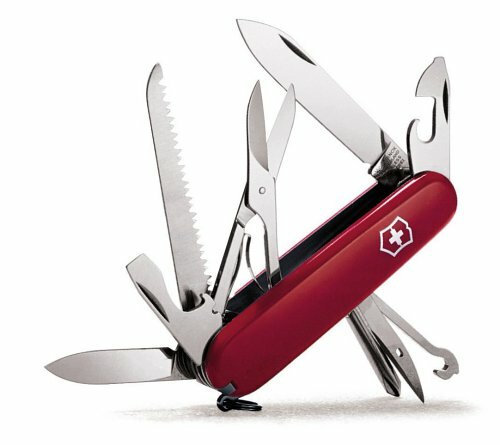 The SwissChamp is a superb multi-tool knife from Victorinox with some great tools packed into it. Where it really wins is in the fact that it has pliers with wire cutters. They’re not terribly large, of course, but they’ll still do the job for a lot of things, and you’ll be glad to have them in a pinch. Again, there’s no option for one-handed deployment of the blades and there’s no locking system for them either, but that doesn’t take away enough from this $75 multi-tool to knock it off this list. View More Images Of The Victorinox Swiss Army Fieldmaster Pocket Knife On Amazon The Fieldmaster is a 3.5in, 3.5oz multi-tool with 15 tools stowed away inside it. There are 2 blades (a large one and a small one), a Phillips screwdriver, a can opener with a small screwdriver, a bottle opener with a large screwdriver, a wire stripper, a reamer, a key ring, scissors, a toothpick, tweezers, a parcel hook and a wood saw. A few of these have been reported to stick a little when you deploy the blades, but ours worked fine—even if it still didn’t support one-handed deployment/locking. It’s still an amazing Swiss Army knife, though, especially given its $32 cost and lightness. This is one you really can carry in most trousers, yet it still has enough of the truly “core” tools for everyday use and outdoor excursions. On the whole, it’s a great compromise if you want something in the light multi-tool category but don’t want to give up too many functions in exchange. View More Images Of The Victorinox Swiss Army American Flag SuperTinker On Amazon This 3.5in knife is the “super” version of the original Tinker Swiss Army knife and adds more tools to the original while retaining the same dimensions. It contains 14 tools in its 2.98oz frame: 2 blades (large and small), a can opener, a small screwdriver, a Phillips screwdriver, a bottle opener, a large screwdriver, a reamer, a wire stripper, a key ring, scissors, tweezers, a toothpick and a parcel carrier. 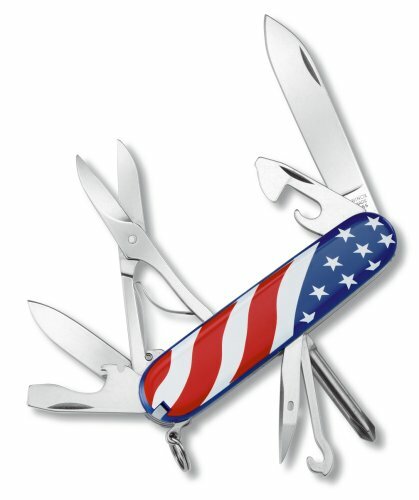 This Super Tinker is available in a patriotic American flag design or Victorinox red. This is another great light multi-tool and is perhaps the best suited for EDC of all the models we’ve discussed thus far. It has some great tools bundled into it, including a Phillips screwdriver and scissors. Probably the only real shortcoming most people will complain of it having is in its lack of a wood saw. That particular tool can really come in handy for a lot of camping jobs, so those who’ve used Swiss Army Knives with one may miss it. Still, this costs only about $30, so it’s far from a bad buy given what it does pack into its slim size. The Classic is a 2.3in multi-tool with scissors, a blade, a nail file/screwdriver, tweezers, a toothpick and a key ring. Its size makes it capable of serving as a keychain attachment, and it still comes with the Victorinox lifetime warranty. This is one small Swiss Army Knife but that doesn’t make it weak in terms of a utility tool. The tools in it may be small, but they still perform sufficiently well to make them genuine aids in a lot of situations. That said, this Swiss Army knife at about $15, has such small utilities that you may well find yourself wishing you had opted for something larger in order to do the job faster in a lot of camping and outdoor situations. For most people, the best Swiss Army Knife here will undoubtedly be either the Super Tinker or the Fieldmaster given that both still fall very comfortably into the EDC weight and blade length range for a majority of users, yet deliver a great mix of utilities despite that. For us, the Fieldmaster wins simply because it has Victorinox’s great wood saw on it, this also makes it one of the best EDC pocket knives out there and potentially a great Christmas present for a loved one. That said, the Super Tinker in iconic US flag livery is slightly slimmer and lighter, so you may well feel otherwise. 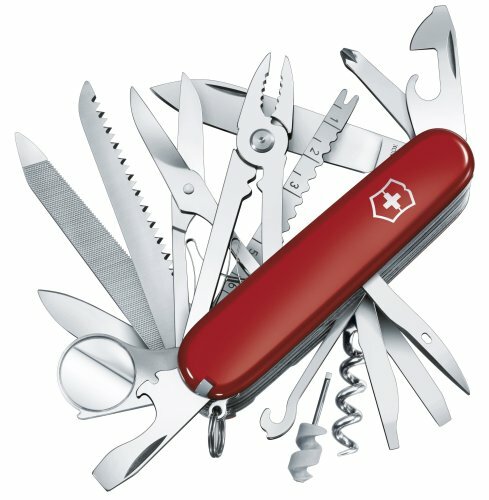 Your new Swiss Army Knife does come with a lifetime warranty but for superior cutting reliability while camping, fishing or hiking it will need to be well maintained. Maintenance will include regular oiling and sharpening of the blades. 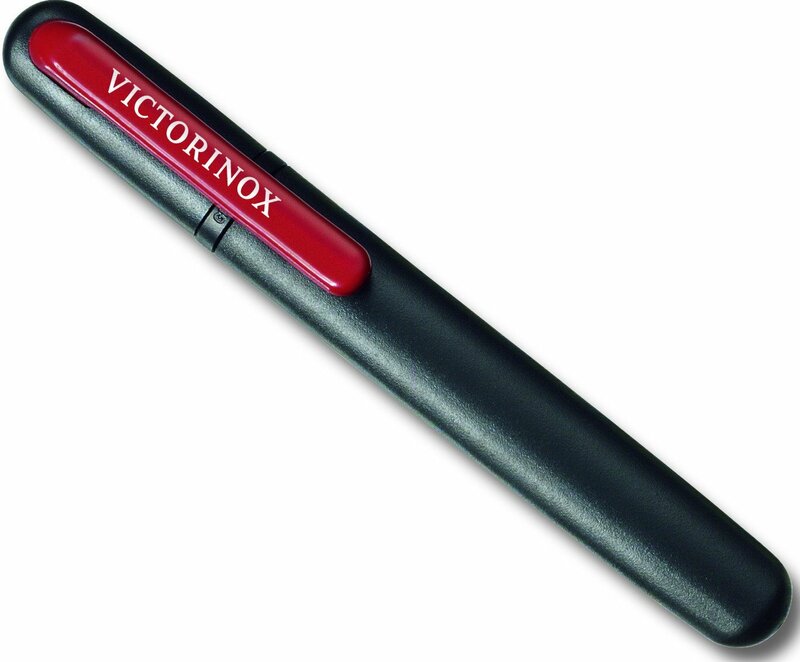 Victorinox have developed their own accessories to make this job as easy as possible and it is worthwhile spending the extra few Dollars to prolong the life of the product. Keep the blades in your Victorinox pocket knife sharp and ready for action. Also useful for sharpening any knife. See the video below. 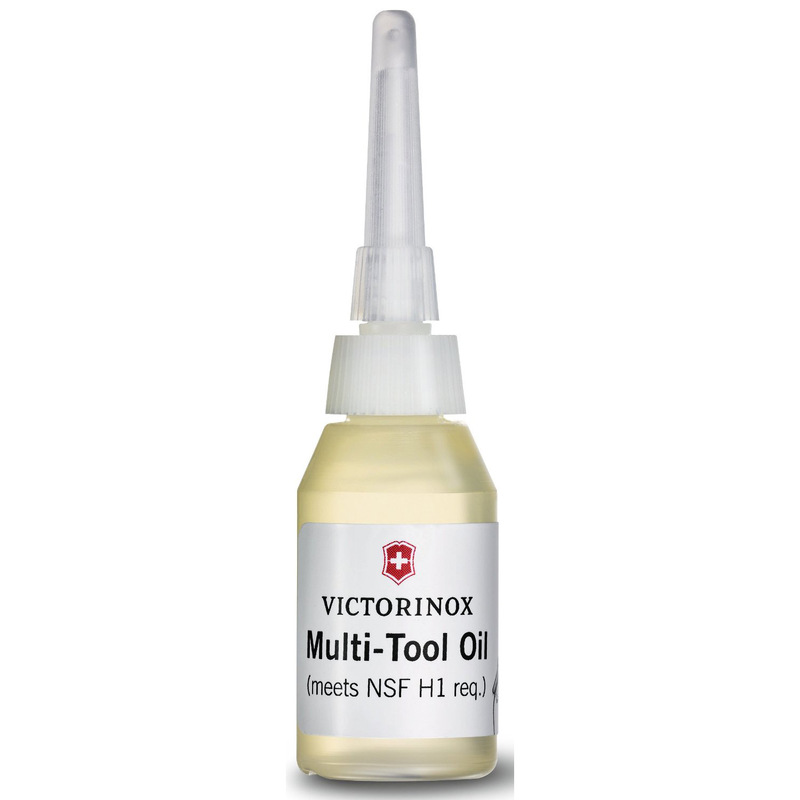 To fight corrosion and maintain the mechanics of your Swiss Army Knife we highly reccomend 5ml of Victorinox Multi-tool oil. 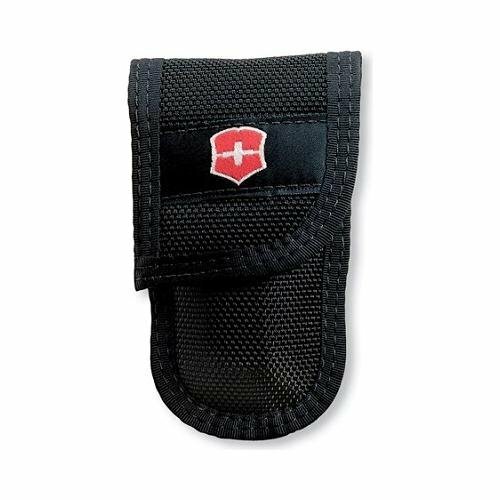 This simple pouch from Victorinox fits through your belt loop and stores and protects the majority of Swiss Army Knives.